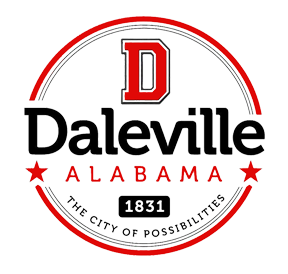 Daleville is located in an area of Southeast Alabama known as the Wiregrass, named for a particularly hardy species of grass that grew in abundance when pioneers first came here one in the early 1800s. Daleville encompasses an area of about 14 square miles in Dale County and sits at the doorstep of Fort Rucker, Alabama, one of the largest military installations in the state. Daleville was named for General Sam Dale, a pioneer scout, messenger, and leader of settlers through the Creek and Choctaw nations along the gulf coast region. Noted for being cool and calm during emergencies, General Dale led troops in the Creek War of 1813-1814 before serving in the Alabama Legislature (representing Monroe County) between 1813-1850. Daleville was one of the earliest towns founded in the Wiregrass area. The land which eventually became Southeast Alabama was ceded to the United States in the 1814 Treaty of Fort Jackson, which ended the Creek Indian Wars. The first non-Native American pioneers began to settle the area in the 1820s. The town of Dale's Court House was founded in 1831 as the county seat of the newly-established Dale County. In 1838 the county seat was relocated to nearby Newton (today, the county seat is in Ozark) and in 1841 Dale's Court House changed its name to Daleville. Daleville remained a small farming community throughout the 1800s. The year 1900 brought the railroad through the center of town, but further development of the area didn't begin until World War II when the U.S. Military established a post north of the town, which was named Camp Rucker. Following World War II, Camp Rucker became a key installation for Army Aviation and its name was changed to Fort Rucker. Daleville's growth and population have been closely linked with Fort Rucker ever since, as thousands of military service families over the past 60 years have found a home in Daleville while stationed at Fort Rucker. Today, the people of Daleville enjoy its small town atmosphere with close access to the many of the beaches and destinations found along the Gulf Coast. Military families who have been stationed around the globe appreciate Daleville's unique blend of international flavors at its many well-known eateries and restaurants. Retail shopping can also be found just a few minutes away in the local and national shopping centers in Dothan and Enterprise. Due to the close proximity to Fort Rucker, Daleville's population also includes many civilian contractors working in various high technology areas of aviation support, from flight maintenance to the most advanced flight training simulators in the United States. Below you can find information about the population of Daleville from the most recent U.S. Census in 2010.